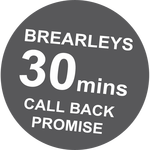 Brearleys Solicitors is a full service law firm based in West Yorkshire providing a professional and highly effective legal service across all areas. We are highly experienced in dealing with every aspect of business related matters. We firmly believe that it is not necessary to go to Leeds to get true expertise. We handle the business and company affairs of both large and small companies locally and nationally in both a litigious and non-litigious context. We believe in building partnerships with our clients so that we are able to make a positive impact upon your business and assist you in your future success. Our lawyers, based in West Yorkshire, help clients throughout the Yorkshire area and offer professional experience in business law, employment, family and matrimonial, personal injury and property related matters. What sets us apart is our commitment to client care, quality of service and commerciality of advice for our private and business clients. We believe in forming long lasting relationships with our clients using our experience and expertise in our specialist fields of law to achieve outstanding results. Operating from offices in Batley, Birstall, Brighouse and Cleckheaton, there are over 20 lawyers and similar numbers of support staff.